As you probably know if you have visited us in the past, at Summit Family Dentistry, our goal is to help you achieve your best smile. Unfortunately, that is sometimes easier said than done. While some out there have naturally perfect teeth, others have to work a little harder at it. 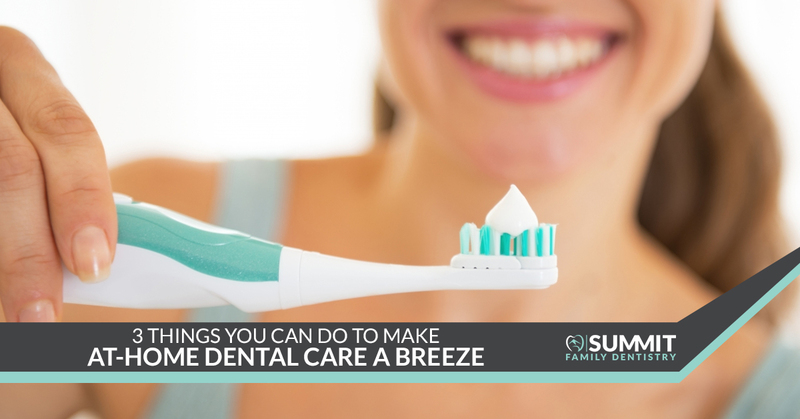 Either way, one thing always remains the same–coming up with an at-home dental care routine can be a challenge. The good news is that in today’s post, we’ll be highlighting three easy things you can do to make your life just a little bit easier. As your go-to Denver dentist, there’s nothing the team at Summit Family Dentistry loves more than helping to make your daily routine just a little bit easier. An added bonus is that it’s almost more effective! If you’re searching for ways to make your routine a little simpler, then today’s post is for you. Keep reading to learn more! Wondering How to Improve Your Daily Dental Routine? Although they aren’t ideal for everyone, for many, replacing a manual toothbrush with its electric counterpart can make a huge difference. Many models even have built in timers, allowing you to know that you’re brushing for the recommended 2 minutes. Some even include buzzers that alert you in 30 second intervals, ensuring that you are brushing all quadrants of your mouth equally. It’s often a win/win situation no matter how you look at it! In the past, the price of electric toothbrushes proved to be cost-prohibitive for some, but the really great news is that they’re more affordable than ever. If you keep your eyes peeled, you can often find them on sale at your local grocery store or shopping center. Prefer to shop online? Even better! Websites like Amazon frequently offer big discounts. Not sure which toothbrush to pick? Read reviews keeping your specific situation in mind. Sometimes the best recommendations come from others who are dealing with similar conditions. Of course you can also give Dr. Andy a call to ask for his suggestion! Does that sound like your experience? If so, you’re not alone! A number of people don’t floss as often as they should, but there is actually good news. The more you get into a regular flossing routine, the easier it gets and the better it feels. Trust us when we say that once your gums get used to the fact that you’ll be flossing more often, it’s smooth sailing from there on out. Been using regular dental floss for years? Try a set of floss picks. Floss picks not for you? Try a water flosser. There’s an option out there that’s sure to work best and the sooner you can find it, the better your gums will be in the long run. As you probably know, mouthwash offers a number of benefits and chief among them is the fact that it cleans and freshens your mouth, ensuring that you don’t have to walk around with bad breath. Swishing some mouthwash around is simple and effective, but it can be easy to get out of the habit of actually using it on a regular basis. Here’s our suggestion: get a new mouthwash next time you’re at the store. Sometimes it’s something as simple as getting a new flavor of mouthwash that gets you back into the habit. For example, if you’ve been using cinnamon for years, make the switch to cool mint. Do you routinely by something from Brand A? Give Brand B a shot! As with the recommendations above, if you need a suggestion for a particular type of mouthwash to use, we’d be glad to lend a helping hand. Perhaps you have sensitive gums. Maybe you need something that offers extra plaque control. You might even simply be looking for a flavor recommendation. Whatever the case may be, we’re a quick phone call away and we’d love to offer some advice! Time for a checkup? At Summit Family Dentistry, we strive to be your go-to dentist in Denver, NC and the surrounding area. Whether you’re visiting us from Denver itself or somewhere else in Lincoln County, we would be honored to be your choice when you’re looking for a family dentist. Feel free to take a look around our website to learn more about us, or if you prefer, contact us today to schedule an appointment. Whether it’s time for a checkup or it’s been awhile since you’ve seen a dentist, we look forward to hearing from you!